Our Dying Planet is a crash course in the ecological crises that face us all, starting from ecologist Peter Sale’s own observations of the “unfolding tragedy” of the world’s coral reefs. It’s not just the reefs that concern Sale: overfishing, deforestation, and climate change all get their turn. All of these cases are the result of the interconnected ways in which humans interact with the environment, whether through deliberate, wholesale destruction of rainforests or by accidentally bumping into coral reefs while diving for pleasure. Sale asks why we tend to view ecology as little more than “advanced nature study” (when according to E.O. Wilson it is “more complex . . . than physics”) and wonders why it is so difficult to get people to understand and prevent ecological disasters. Sale is more upbeat in later chapters of the book, sketching out prospects for stabilization, if not recovery. Our Dying Planet is not so much an unheeded prophecy as a deeply researched and clear-eyed call to arms. The reader is shown the links between shifting landmasses and organic patterns that have shaped life on our planet. Beautiful maps and illustrations highlight the stories of “intrepid” early ecologist/adventurers—“swashbucklers, all.” Dragons explains, among many other things, the peculiarity of Australian fauna, why islands are hotbeds of diversity, why New Zealand is home to flightless birds, and how placental mammals came to rule the terrestrial world. McCarthy ends by envisioning the “grand coalescence of life and Earth,” restating the importance of biogeography for understanding not only the past, but the future of our planet. 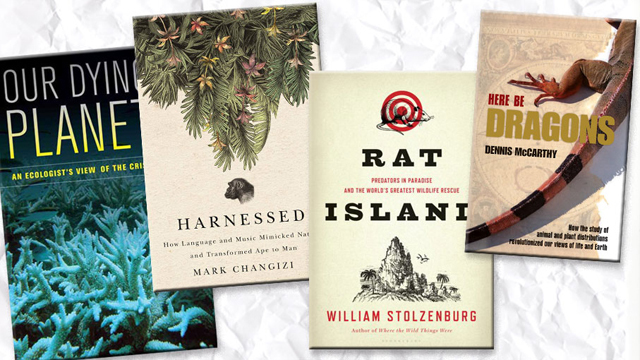 Rat Island is a novelistic romp through ecological disasters that have already occurred—and the military-style campaigns that have been waged to reverse them. The war for survival described in this book is a battle on many fronts, but two in particular are featured: New Zealand and Kiska, a 22-mile-long island in the Aleutians off Alaska. Two birds, the kakapo of New Zealand and the auklets of Kiska, are pitted against introduced predators: foxes, weasels, cats, and, above all, rats. Polynesian settlers were the first problem to face New Zealand’s native fauna. Flightless birds such as the kakapo and the now-extinct giant moa suffered under the combined onslaught of the Maori settlers’ spears and the depredations of the dogs and rats that accompanied them. Some endemic species managed to hide away on New Zealand’s smaller islands, but the arrival of European rats, followed by cats, weasels, ferrets, and stoats (brought in to control the rabbit problem), threatened them even there. Today the kakapo teeters on the brink of extinction. The story of Kiska’s auklets tells of the “take-no-prisoners” conservation approach that unleashed a barrage of the new poison brodifacoum, a powerful anticoagulant, ridding entire small islands of rats and eventually leading to the liberation of Kiska for the auklets. Similar tactics in New Zealand, involving poison and traps and rifles, bring wildlife journalist’s Stolzenburg’s book to a close with hope for the kakapo. Music and language are puzzling. They both have emerged relatively recently in human evolution, much too rapidly to be a result of heritable genetic change. How do we explain, then, that we appear to be designed to speak and make music? The answer, in cognitive scientist Changizi’s view, is that music and language evolved to fit our brains, not the other way around. Our seeming musical and verbal “instincts,” Changizi thinks, constitute a case of “neuronal recycling”: mental circuits wired to recognize sounds on the savannah or the movements of fellow tribe members have been pressed into new roles. Speech and music simulate nature. Changizi demonstrates this by showing that the three basic building blocks of sounds in the natural world are the three basic sounds of things interacting physically: hits, slides, and rings. These correspond to the three airflow mechanisms of human speech—plosives, fricatives, and sonorants—while the beats of music evoke human footsteps. Changizi develops this simple but striking premise to show how language and music have been able to harness our brains, and that our prehistoric ancestors might not feel so out of place in the modern world after all.